We were finished in under an hour. Haka Dave won his game against Ben Vaughan a couple of minutes later. The Grinder came down to Wigston to watch and was so engrossed in the games that we were unable to catch his eye when we left. Raymondov is currently on tour in Russia. On Tuesday, there will definitely be a club night and i will be playing my last Counties game against Guy Closs. Last night we played against Syston 2 in the Harrod Cup. Having managed to beat Syston 1 8-0 previously (albeit without any "assistance" from me), it was a fixture that we had reasonable hopes of winning, even allowing for me picking myself. On the top board our main man John Manger played Stuart Hollinworth, and bagged two points. John has really turned into Mr. Dependable this Summer, and I am off to William Hill after finishing this blog to put a few quid on him for the 2012 David Ward Memorial Trophy. Stuart said that (at least with regard to the second game) John always had the edge. I played Judith Mitton. In the first game, playing White, I completely messed up the opening, and having castled in opposite directions, I found myself the exchange down. However, my opponent soon found herself in time trouble, and by the point when her flag dropped, I had a pawn on her seventh rank. In the second game, Judith dropped a piece early on to a pawn fork, and then later dropped a bishop too. I then, without any subtlety or finesse, removed her pawns and pushed my pawns forward, to win. Ray played Reg Agger, and won his first game, although I can't provide any information. He lost his second game after dropping his Queen. Gary picked up his first rapid-play win in his first game, but his opponent repaid the compliment in the return. Well done to Gary on that milestone. Unfortunately, we had to play in the Bar, due to the presence of the Women's Institute and the Royal British Legion. Mo Martin, who was non-playing Captain of Syston, gave John the sobriquet of "The Grinder". Maybe that is what chess needs - a bit of razzamatazz. Suggestions for other names for club members gratefully received. It is unlikely that there be a club night next week, as some of us are engaged in the unequal struggle that is the County Championships, others are gadding about, and I don't think the Wylie Cup side are in action. Last night, i played a County Champs (Major Section) game against Bob Collins. With the white pieces, i had decided on the plan of attacking like crazy. In this position, i played 8 Bxf7+ following this up with the knight check and some threats against the King and Queen. In this position, i played 15 Qf7+. 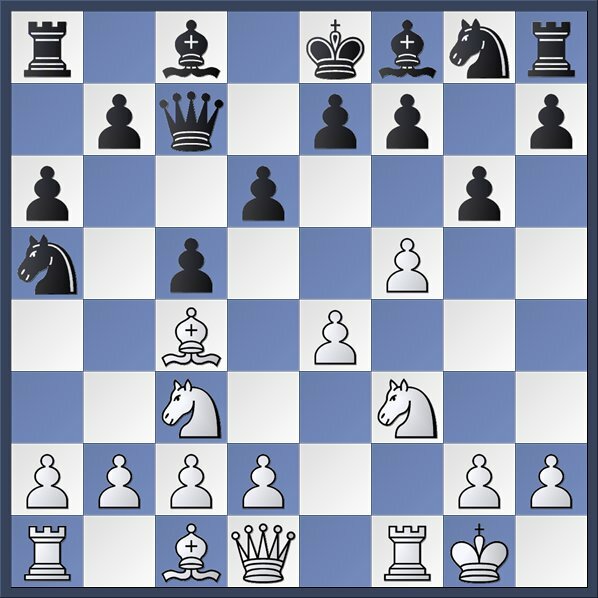 This was blocked by Qe7 and then a couple of moves later the king escaped over to c7 where i was unable to reach it and, with things looking like they might be turning to Bob's advantage, we agreed a draw. 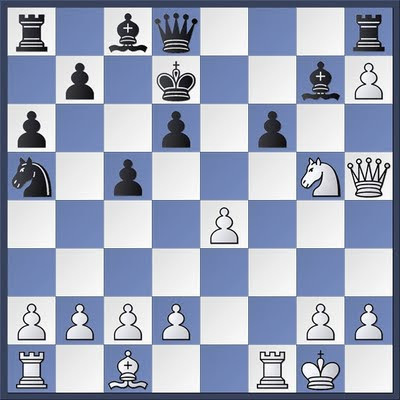 In the diagram below, Fritz gives 15 Nf7 Qf8, 16 d4 as being enough to win the point (i am not so sure though). This result leaves me with 2 points from 4 games with two to play. Bob now has three points from four games, and David Reynolds (we think) has 2.5 points from three games. Tonight, there is a Harrod Cup match at the Heathcote against Syston 2. Last night's result. Sorry, I didn't have chance to see the other games apart from John's last ditch win, so I can't give any comment. This win puts us a top of Wylie cup, 1 point clear with Wigston to play on 8th September. Well done to our first team for their performance above. A great result against a strong Braunstone 1. In the Harrod Cup, we have been drawn at home against Syston 2. Haka Dave has offered Syston a choice of dates of Tuesday 16th August and Tuesday 23rd August - the rules of the competition dictate that they must accept one of these. The chances of being able to get a friendly game at the Heathcote Arms on either of these two nights is high. Over the next couple of weeks, there will also be some County Championship activity at Wigston with the Open section competing in round 5 on Thursday 18th August (with Graham Sharpe still top of the leaderboard), and the rest of us competing on Thursday 25th August. Graham Booley volunteered as Board 1 (as Pete Harrison was being all artistic) and played Peter Gibbs, and despite putting up a good fight lost both his encounters. The one very bright spot was John Manger, who beat Jason Smith on both occasions. I played Barry Bailey, and was comprehensively outplayed in the first game, when I was Black. In the return, I went a piece up early on, and after we repeated the position three times, neither Barry nor I claimed the draw. For me it was subsequently proved a mistake, but at 3-1 down at half-time, I felt there was no real choice but to play on. Ray and Terry Clay won one each. I might be getting a phobia, but we've had three Harrod Cup fixtures, and in two we've been beaten. The fixture I wasn't there for, the side won. There was a good turn out with Bubbs Major & Minor, Gary & Gordon turning up. On Tuesday the serious players have a Wylie Cup match (and John Manger has won a well-earned promotion to that side after his 4-0 Record in the Harrod), and Ray & I are coming to play some beer chess and watch the experts. So there will be a club night.